Cargo theft remains one of the most significant causes of disruption in the supply chain, accounting for around 10% of all reported claims in the last ten years, according to a new analysis by TT Club. 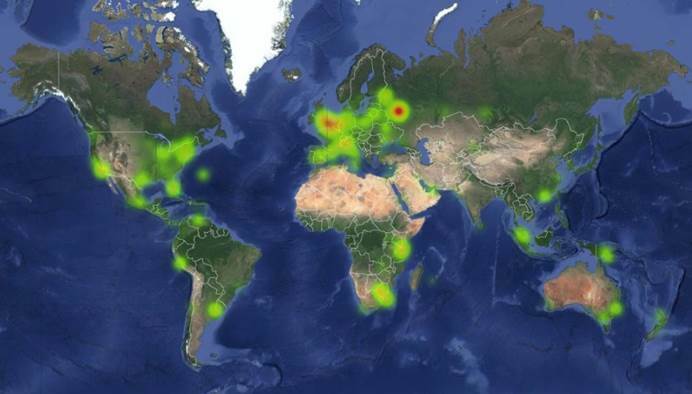 The analysis includes some interesting statistics on where, when and what is being stolen along the supply chain worldwide. Where is Cargo Theft is Occurring? According to TT Club, theft “hot spots” are not restricted to areas suffering economic down turn. The data also shows that more cargo theft is occurring on key traffic routes near major ports and terminals. Crowded road networks with insufficient secure parking areas are prime targets for thieves, but even less travelled routes are not exempt. There have even been reports of high-value cargo being stolen from trucks while moving! When is Cargo Being Stolen? 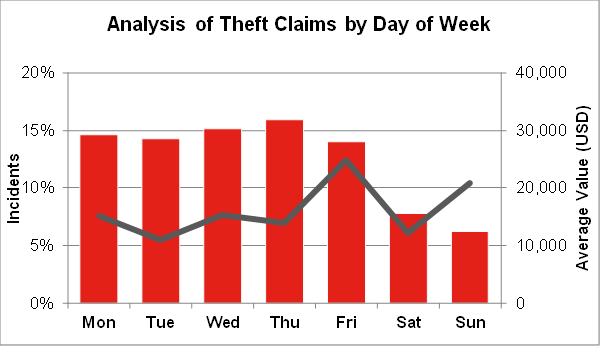 Not surprisingly, the majority of thefts happen during the work week (Monday-Friday), with Thursday accounting for the highest number of incidents, and Friday proving most lucrative for thieves in terms of dollar value. Even though Sunday has the fewest number of incidents, the value of goods stolen indicates a more thought out and targeted approach to cargo theft on this day. Looking at theft by month, there is relative consistency until things peak in the latter part of year. 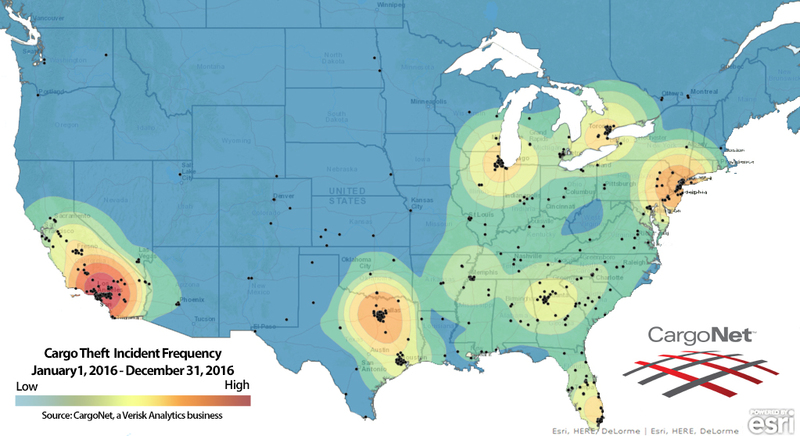 Cargo theft patterns appear to be heavily influenced by peak freight movements around the holidays. What Cargo is Most Frequently Stolen? TT Club’s findings are consistent with other recent cargo theft reports, many of which include numbers that are positively staggering. Earlier this year, in its annual cargo theft trend analysis, CargoNet reported 836 cargo theft incidents in 2016 worth an estimated $172.9 million. Cargo theft accounted for more than half of all freight-related theft in 2016, according to CargoNet. All of this has transportation and logistics firms increasingly turning to technology to ensure the security of cargo from origin to destination. Specifically, the industry is leaning on Internet of Things (IoT) and sensor-based technology that use real-time data and exception based reporting to send alarms and other notifications to fleet operators when cargo is being compromised. A turnkey solution geared toward cargo security should include state-of-the-art tracking devices, sensors, cellular and satellite connectivity as well as desktop and mobile apps that make it possible to track the location and status of in-transit and stored cargo at any time. For example, ORBCOMM’s CargoWatch Secure solution helps companies minimize theft and enable quick recovery of stolen cargo, monitor the estate of in-transit cargo to help prevent damage, identify route delays to properly manage customer expectations and optimize and automate the supply chain. To learn more, visit http://www2.orbcomm.com/cargo-security or see us this week at Booth 212 of the IANA Intermodal Expo in Long Beach, CA.